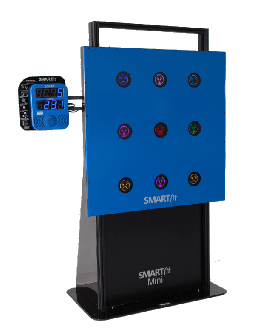 The SMARTfit™ is a highly-advanced, technological workout machine that integrates specialized programming to train the brain and the body by building strength, optimizing motor skills, and enhancing cognitive functioning. By utilizing this revolutionary machine today, you will improve all areas of your being for the rest of your tomorrows! SMARTfit™ is a collaboration of products that utilize functional training and brain training software programs to optimize both the body and the mind. It is powered by an APP that is Android/IOS based to activate targets that are considered to be “intelligent” in order to move participants through movements that are designed to coordinate the motor, the cognitive, and the functional movements that must be engaged. According to research, this advanced system optimizes neuroplasticity and neurogenesis. The programs that are included in the system as gamification; that is, fun, interactive, and highly appealing to users. For years, scientists, researchers, and doctors have established that there is a direct link between physical activity and improving the brain. In turn, this has a positive result on other aspects of a person’s health. Studies have indicated that the way to get the most results from exercise and cognitive enhancement is to stimulate both the brain and the physiological aspects of the body in a simultaneous manner. SMARTfit™ is designed to stimulate the nervous system in many different ways, through the utilization of sensory inputs. As a result, this program offered through SMARTfit™ and all of the components of the tool has been found to be exceptionally beneficial for sports training, rehabilitation for those that have suffered from a concussion, rehabilitation for balance, as well as the general optimization of brain fitness. In years past, rest was considered to be the ideal recovery method for concussions. This is no longer the case. According to doctors, physical therapists, and other types of medical professionals improving the blood flow is the key to recovering quickly from a concussion. Furthermore, because the issue most often stems from complications within the neck and upper back region, it is necessary to manipulate these areas to overcome the common symptoms of headache, balance issues, and vision problems. The SMARTfit™ system is designed to activate all areas of the body to ensure a rapid recovery of concussion. Whether received as a result of an accident, a fall, or playing your favorite sport, you will be thrilled with the results experienced when conducting concussion rehab with the SMARTfit™ system. Do you suffer from a balance issue? If so, you need to work out both the body and the mind to experience the best results in overcoming that issue. When working with the SMARTfit™ system, you will undergo a rehabilitation program that enhances the visual processing and auditory processing of your body. The motor integration will provide vestibular input and optimization. You will find that you fall less due to the overall enhancement of the sensory processing skills and perceptual motor skills that are increased during the workout of your brain and your body. Postural control, becoming aware of your body’s overall positioning, and being able to regain control of your movements are just a small glimpse of the many rewards that you will experience while performing this type of rehabilitation. The SMARTfit™ system provides advanced-level neuro-cognitive training to optimize the overall fitness level of your brain. In a world where dementia, Alzheimer’s, and other cognitive-based impairment disorders are becoming increasingly prevalent, it is essential to work out and train the brain. We here at Back to Motion have seen the immense results of the SMARTfit™ system. We now offer this amazing tool to our clients. It does not matter if you want to improve your memory, improve your core strength, or overcome the challenges posed by an injury or an illness, you will achieve the results that you desire.